it looks like they tried to fix it... the beginning of the A almost looks like an E. Still missing an apostrophe, though. By the looks of the fat around the waist, this person obviously "eats to know 'there' still alive" Misspelling on their/there was intentional.- If your misspelling was intentional shouldn't you have said "there/they're"
he gained 40 pounds so the whole thing would fit. You're going to bleed to know my alive? Epic fail because it's a Goo Goo Dolls lyric tatt, even if it came out perfect. why does everyone mispell "you're" when getting a tattoo? maybe you EAT just to know [you're] alive? You can still bleed when 'your' dead. Luv that song！Iris by goo goo dolls!!!!!!!!!!!!!!!! 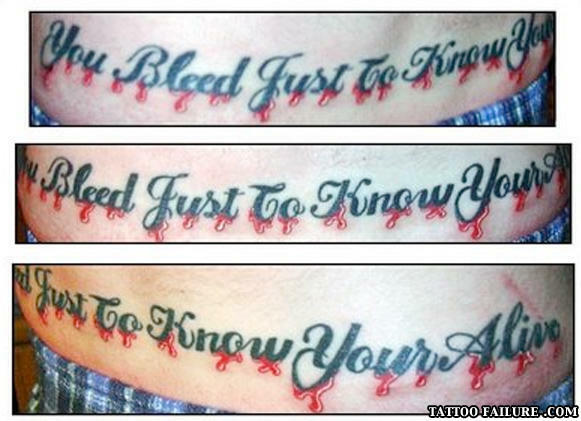 but how will you know if you're really bleeding or its your terrible tattoo?! Since when does someone do a tattoo with lyrics from a bad 80's song. What did the sexually promiscuous man get for Christmas?